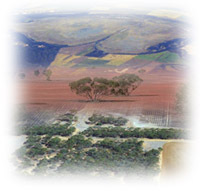 The Mallee Regional Catchment Strategy (2003-2008) is available for download from the Mallee Catchment Management Authority website. Information on the Mallee Sustainable Farming Project . Information on Floodplain Management on the DELWP website. A full text downloadable version of the former Land Conservation Council's Final Recommendations for the Mallee Area Review (August 1989) are available on the Victorian Environmental Assessment Council website. These provide an ongoing framework for public use of land in the area. The recommendations are grouped under major headings, such as Parks, Wilderness, Flora and Fauna Reserves, Agriculture, State Forest. Key recommendations are for the Wyperfeld and Murray-Sunset National Parks, Big Desert Wilderness, and riverine and dryland State Forests. The recommendations in the text incorporate those of the LCC's original Mallee investigation, and have been edited to reflect government variations and amendments at the time of approval, and subsequent changes. The Victorian Landcare and Catchment Management Magazine online site of Landcare provides copies of all these magazines dating back to 1996.